Looking south on Broadway Street from the corner of Eighth Avenue on the day before Memorial Day. 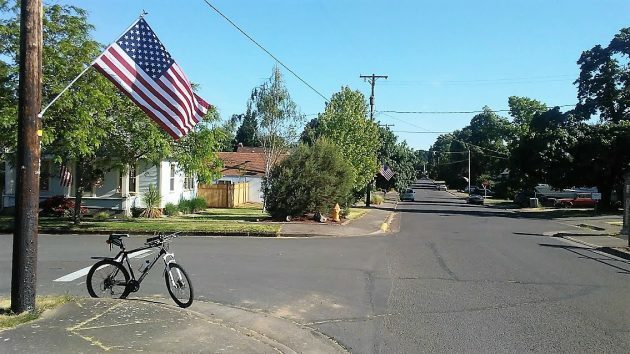 For years, on patriotic holidays somebody has been hanging flags from the power poles up and down Albany’s Broadway Street, but I don’t know who. Whoever it is — individual or group — did so again this Memorial Day weekend, as always intended to be a somber occasion going back to the years after the Civil War. Lots of people put out flags at their houses, of course. But it’s a special service to the community to do so for neighbors along several blocks of an entire street, and one or two side streets too. It is Ed Panpinella and his neighbor on Broadway. They have done it for years they have done it on S. Broadway and recently have been on Broadway north of Queen. They store the flags, put them up, take them down and put up flag holders as needed. It is a wonderful sight to see and we are grateful for them. Now that is worth repeating ! Hurray for public spirit ! Aw gee whiz, now the replicated comment is gone ! Thank you, Mr. Panpinella. I look forward to my part of town displaying the flags on Memorial Day. Your work is appreciated.